It is not for this review to outline the decades of influence on education and thinking that has made Edward De Bono’s career. However, if you are looking to improve your students’ depth of thinking and creativity, enhance your own thought processes, and understand school, work and life better, then this book is for you. 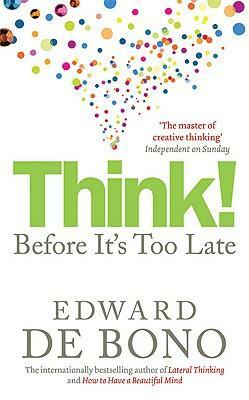 “Think!” is a de facto ‘best of’ De Bono’s work. Covered in this book are examples of De Bono’s work on lateral thinking, creativity, perception and judgment. Each chapter runs through a different aspect of DeBono’s work, providing clear reasoning and supporting evidence. De Bono argues that old ways of thinking don’t work anymore, or are at best limited in their usefulness. Using examples like Socratic argument, De Bono provides clear examples of how learning, business and politics could be improved by thinking differently. The book also provides an incredible array of formal tools for use in the classroom, staffroom and living room, to create better thinking processes and solutions. This is perhaps the strongest aspect of De Bono’s work for educators, it’s usability in multiple settings, e.g. the classroom, the staff room, or the lounge room. Whether it is using the collection of DATTs (Direct Attention Thinking Tools), Lateral Thinking Tools, Creativity Tools, there really is a tool to help direct thinking for any situation. Now for the frustrated and cynical teachers out there, I know what you are thinking. De Bono invented the PMI tool (Plus, Minus, Interesting), and if I have to sit through another staff meeting where a PMI is used I am going to throw up. Why should I read this book? Well, you should read this because the answer to better thinking, better leadership and better meetings lies inside. Leaders fall back on the PMI, because it is easy to use and everyone knows it, not because it is the best tool for the moment. Your job as a leader is to identify the best tool to elicit the type of thinking you are after, and make sure that you use it. Then spread the word, and make sure everyone in your school is employing the right thinking strategies for the right purpose.